Send PCHES to Michigan in May! Hawaii’s very first qualifying game team is going to Michigan to compete at the 2016 World Robofest Event in May! 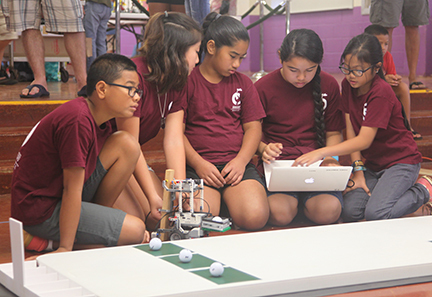 PEACHES (Team 1648-2 from Pearl City Highlands Elementary School) will be competing against teams from all over the world. The event will be held at Lawrence Technological University in Southfield, MI., Robofest Headquarters. Congratulations to Coach Gary Kanamori, Principal Michael Nakasato and their students! Please rally around them and contribute to this historic journey by making a donation to their GoFundMe website: https://www.gofundme.com/224acn6x Proceeds will go towards their travel expenses. Please feel free to share this announcement and link with everyone! Go PEACHES!